The last few weeks of 2018 were exactly what we needed — Curtis had a very light schedule and we had plenty of time to relax and spend time together. I remember enjoying holiday stand down last year, but this year it felt so needed. We had a few ideas for longer hikes that we hadn’t done before, but ended up not doing anything too extreme. We used the poor condition of our hiking boots as an excuse. 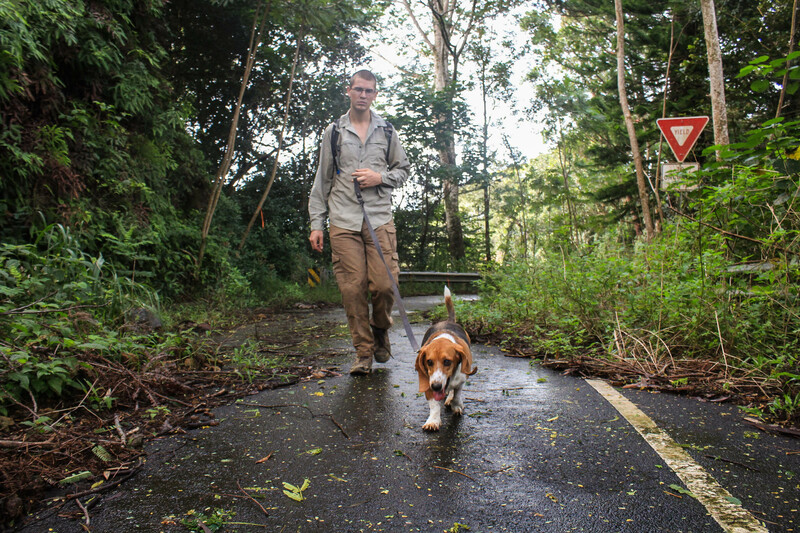 Instead, we filled our days with easy walks with Charlotte, and several outings and short hikes just for the two of us. 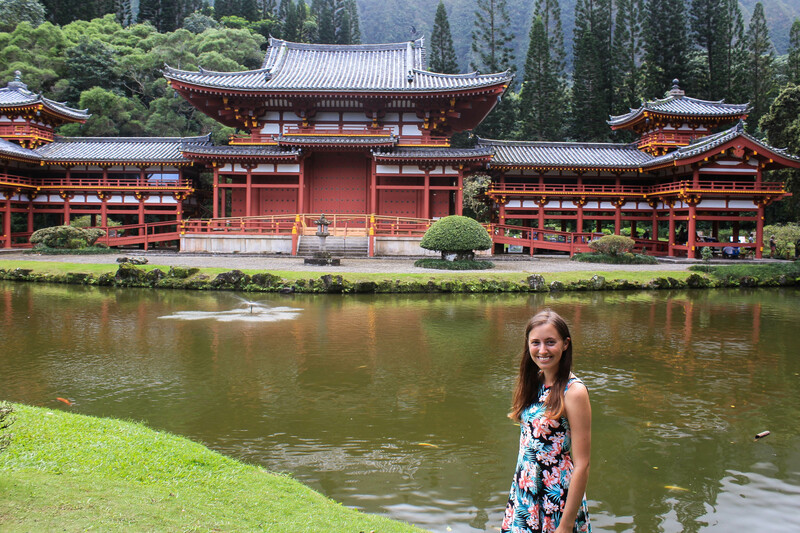 One new place we visited was the Byodo-In Temple in Kaneohe. This is located across the street from the Pu’u Ma’eli’eli Trail, and while we’ve driven by so many times we’ve never ventured back through the Valley of the Temples. The temple is found towards the back of a large cemetery and costs $5 per person to enter the grounds. 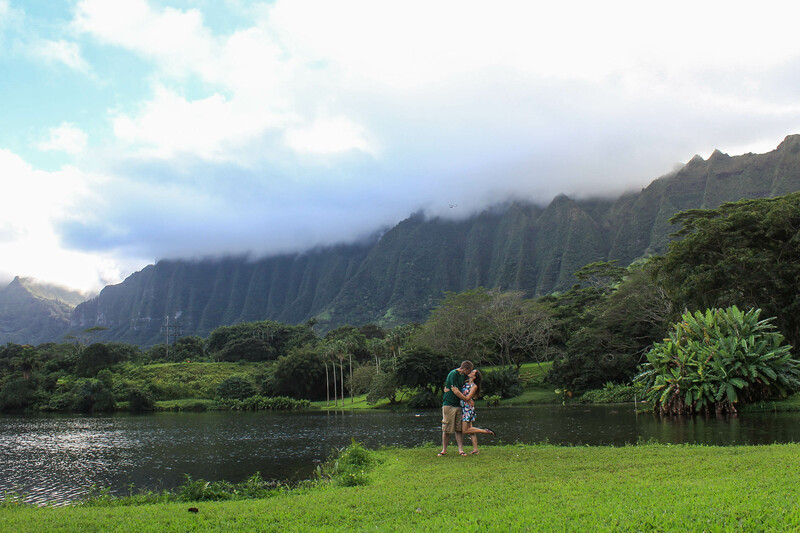 It’s very picturesque, with Japanese styled architecture and Norfolk pine trees backdropped by the Ko’olau Mountains. 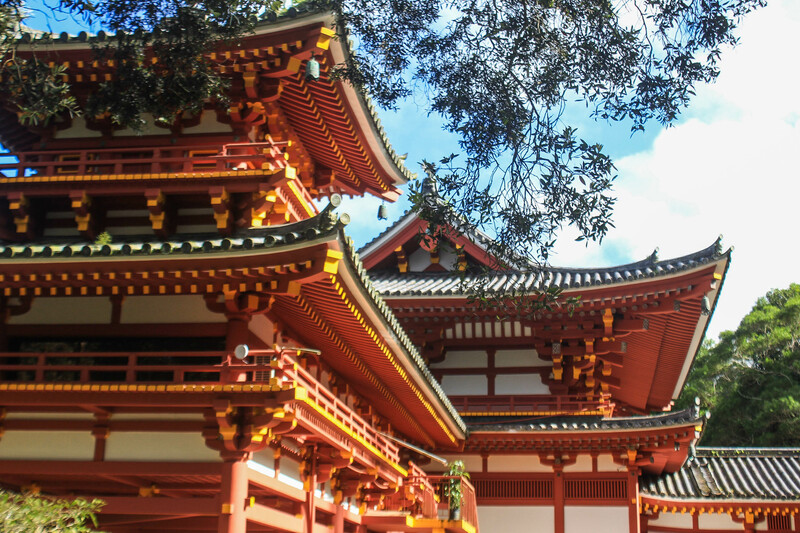 The temple itself is a half size replica of a 900 year old temple in Kyoto Japan. After our visit here, we returned to Ho’omahulia Botanical Gardens — one place I’ve come to often, but always find something new in bloom that catches my eye. Curtis had to work on Christmas Eve, but we spent all of Christmas day together. We continued our tradition of cinnamon rolls, watching Die Hard and doing puzzles, skyped with our families, then went to a friend’s house for a Christmas dinner. Our last hike of the year was on December 30, when we drove up to the North shore with Charlotte hoping to do an easy hike. Unfortunately we had forgotten about the crazy surfer traffic up here in the winter months due to the huge waves, and parking was scarce. We ended up driving up to the Pupu Kea Trail, a lesser known hike which Curtis and I had done in our first month here but hadn’t really thought about since. It ended up being perfect for the day though, we just walked on the old abandoned road and Charlotte loved it. We even found an avocado on our way back! Curtis and I attended his boat’s New Year’s party that evening, which was held on the USS Missouri in Pearl Harbor. It was our first time visiting — unfortunately we couldn’t tour the boat, but we enjoyed watching the sun set from the deck and had an enjoyable evening with friends. Curtis worked on New Year’s Eve, and I did my best to keep Charlotte calm while the fireworks boomed all night long — starting at 11:15 that morning and lasting long passed midnight. Thankfully she doesn’t get too scared, but I could tell she wasn’t enjoying the constant noise and smell of smoke all night. Now that we’re already almost through with January and back to long work days, these last few weeks are an even sweeter memory. I’m doing my best to relish the memories rather than wait impatiently for the next ‘break’… Here’s hoping we don’t have to wait until next Christmas (or later)!